Android in the enterprise requires improvements in security, management and app stores. A typical enterprise needs to have a way of managing a fleet of devices, whether personal or company owned. There are currently a number of vendors providing solutions to this problem, including 3LM, Good Technology, MobileIron, and Sybase. What needs to happen: Google needs to help create a standard for a complete enterprise Android solution, or it must support one from a third party. Until recently, the closest candidates were the Motorola Droid Pro and Photon lines, but Google’s planned acquisition of Motorola could yield a full enterprise option. Keep in mind that Motorola already owns 3LM, one of the leaders in Android security solutions. CIOs need to enforce their security policies, and they also want to be able to wipe a lost or stolen device. Android does provide the plumbing for most of this work and third-party vendors are starting to create solutions on top of it, such as Motorola’s Enterprise Device Policy Management API and related MotoBlur solutions. What needs to happen: This market is getting fragmented, and CIOs will need to do their own research for the right solution for their particular enterprise. Most corporate networks are secured with either SSL or VPN solutions. Android supports both, at least on paper. The problem is that corporate America typically uses proprietary VPN solutions from vendors like Cisco and Juniper. That means that most Android devices do not offer any useful VPN options to corporate users. This is a big issue that is slowly being addressed by device manufacturers. Companies like Samsung are entering into licensing agreements with the Ciscos of the world to make sure enterprise-grade VPN is part of their Android product lines. What needs to happen: Carriers or OEMs need to bundle the right VPN solutions with their devices. We’re starting to see this with certain Motorola models on the Verizon and Sprint networks. I often hear IT people say they want to control the types of applications and content users can download to their company phones. While it’s possible to wall off a company-issued device, it’s an expensive strategy that creates a false sense of security. A better approach may be to allow coexistence of both corporate and personal applications on the same device. Android already provides solid application sandboxing, which isolates data so each app has its own data privacy. What needs to happen: IT departments need to provide enterprise-grade apps for enterprise data. Those departments must also get used to corporate apps coexisting on devices with consumer apps. A good example of enterprise apps is Google’s Apps for Enterprise cloud solution and its mobile counterparts, such as GMail, GTalk, and Docs. Google’s Android Market is based on reactive testing that basically crowd sources quality assurance. That model won’t cut it for corporate clients. The rise of enterprise-friendly boutique markets, like Cisco AppHQ, could provide the needed alternatives for enterprise adoption. What needs to happen: The free market needs to work its magic. Multiple app stores are a good thing, and eventually consumers will know which brand to trust for certain types of applications. Google could help the process by allowing other stores to list their apps on Google’s Android Market. Carriers could also pre-load multiple store apps. While Android doesn’t come with all the enterprise bells and whistles, it’s built on a strong and secure foundation. And while Google needs to do more to provide the missing pieces, the company has created the infrastructure for other companies to step in and fill out Android’s enterprise offerings. 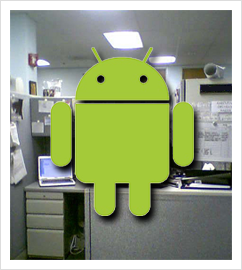 The strategy appears to be working, as research has found Android to be gaining adoption within corporate IT departments. As more employees bring Android devices into their offices, and as Android’s corporate offerings mature, I expect enterprise acceptance to accelerate in the years ahead.